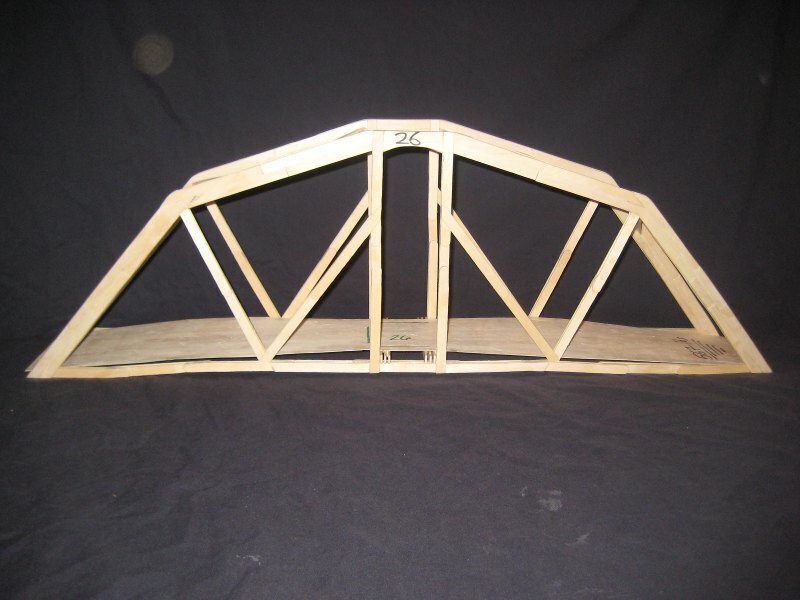 The American Society of Civil Engineers has been putting on an annual popsicle stick bridge competition for high schools in western Washington for the last 13 years. Last year, I entered with a 350 gram, 30 inch long bridge that carried 567 pounds under their hydraulic press. Their website is http://www.seattleasce.org/ymf/popsiclebridge.html . They score the bridges on efficiency (I won at that!) and aesthetics (I don’t know why I didn’t win at that). Carolyn, the author did not submit any plans for this bridge. I am not aware if he has any available. Made a .86 ounce bridge that held 83lbs giving it an efficiancy of 1544.2! Nice! Do you have any pictures of your bridge? This last year I entered an amazing bridge that won both aesthetics and efficiency. It was 350 grams, 30 inches long, and held 993 lbs, 1300 times its own weight! The materials are: high grade popsicle sticks, elmers white glue, lots of clamps, lots of thinking, lots of time(they allow about 4 months), good craftsmanship, and a lot of patience. Thanks for sharing, Darrel. Do you have any pictures of your bridge or that competition? then start combinning some popsticles to make a medium size arch to hold about 10 pounds with will trigger it to weild more weight for your science project. at the end you should come out to about 40-70 pound bridge that can probubuly hold about 100-200 pounds of weight. 50 queries in 0.584 seconds.